Which Compounds Are Most Beneficial in Neck Creams? The skin on the neck is thin, delicate and prone to sun exposure. Maintaining a regular skincare regime, with specially formulated products that target the skin of the neck, can help to slow or reverse the signs of aging. Some of the issues that neck creams can address include pigmented skin, dryness, fine lines and wrinkles, and sagging. Potent compounds that can help to refresh and subtly lift the skin of the neck include retinol, amino acids, peptides, shea butter and hyaluronic acid. Regular skin care regimes can be supplemented with non-surgical treatments such as Ultherapy, Thermage, or laser. If you think you could benefit from a non-surgical neck treatment, a consultation with an experienced doctor near you could help you determine which procedure may be suitable. When it comes to skincare regimens, the neck is typically overlooked but a youthful facial appearance can often be undermined by a wrinkled neck. The skin of the neck is thinner than other areas of the body, and almost constantly exposed to the aging effects of the sun’s UVA and UVB rays. Proper care of the neck’s delicate skin and regular use of neck creams can help to keep the skin taut, supple and minimize the appearance of wrinkles. Pigmentation on the neck is most commonly caused by sun damage. Solar lentigines, also known as sun spots, appear as dark spots or patches on the neck. They occur when melanin is produced in high concentrations following years of prolonged sun exposure. The appearance of fine lines and wrinkles is one of the most common neck concerns. As the part of the body that twists, tilts and turns all day, the skin of the neck regularly creases and relaxes. However, there are additional factors that cause the neck to wrinkle. ‘Tech neck” is becoming an increasing issue as inclining the head to constantly gaze at screens exacerbates the formation of wrinkles. Sun damage thins the neck skin because UV rays cause collagen to break down at an accelerated pace. Lastly, sleeping on one’s side can also lead to collagen damage of the skin, due to prolonged pressure on the neck and decolletage. Sagging neck skin, the dreaded turkey neck, is yet another consequence of prolonged sun exposure. If you haven’t religiously applied SPF to your neck every time you’ve been outdoors, you’re more likely to have slightly lax neck skin. Laxity is caused by collagen damage, which over time results in fine lines and loose skin. Sagging neck skin may also be hereditary; our genes play a large role in determining when and how we age. Few people know that the neck has fewer sebaceous glands than the face, leaving it more prone to dryness and irritation. According to the American Academy of Dermatology, some neck creams can subtly improve the appearance of the neck. One of the most effective ways they produce results is by moisturizing and plumping the neck skin. Creams typically see more limited success with lifting neck skin, however, products containing retinol can create gradual lift over time by promoting collagen production. Retinol: Retinol helps to stimulate the creation of new skin cells, and promotes collagen production. It also works to fade dark spots caused by photodamage, hormonal changes or scars. Over time, it leads to smoother, plumper, more even-toned skin. Hyaluronic acid: Hyaluronic acid is a humectant, drawing water towards it, preventing moisture loss. When applied to damp skin on the neck, it forms a barrier and provides a moisturizing effect that makes the skin smoother. Shea butter: As neck skin tends to be dry, deep moisturizing ingredients are essential to smooth the skin’s texture and fill out fine lines and crepey skin. Shea butter is one of the richest sources of natural moisture, because of its high concentrations of fatty acids. SPF: Dermatologists agree SPF is the most essential ingredient to include in your daily neck skincare regime. SPF protects against sun damage, which is responsible for causing fine lines, wrinkles, pigmentation, broken capillaries and skin cancers. Aim to use SPF 30 at least. Amino acids: Amino acids form part of a group of components called the natural moisturizing factor (NMF), which is found in healthy, normal skin. One of the key functions of amino acids is to maintain adequate skin hydration. Amino acids help to form a barrier on the skin’s outer layer, and keep the skin pliable. Like hyaluronic acid, amino acids are humectants. Peptides: Peptides are short chains of amino acids. Specific peptides teamed together signal to the skin that it needs to increase collagen production, which in turn helps to reduce the appearance of fine lines and wrinkles on the neck. 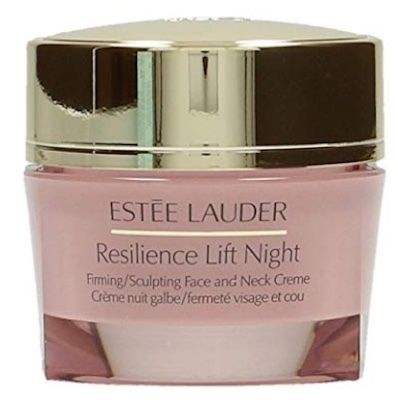 This multi-purpose cream is designed to uniformly improve the skin’s appearance across the face, neck and chest. 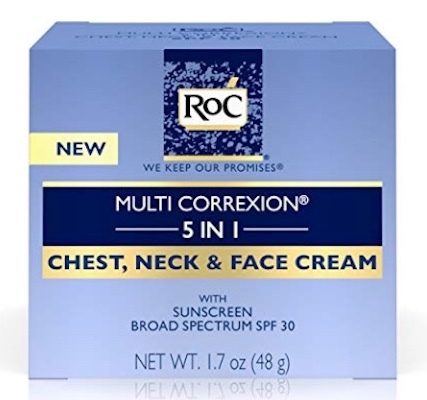 ROC’s formulation is deeply hydrating, helping to smooth out the appearance of fine lines. Hexinol also features in this popular product, which has been proven to brighten the skin, fade the appearance of dark spots and help the skin appear firmer and more elastic. 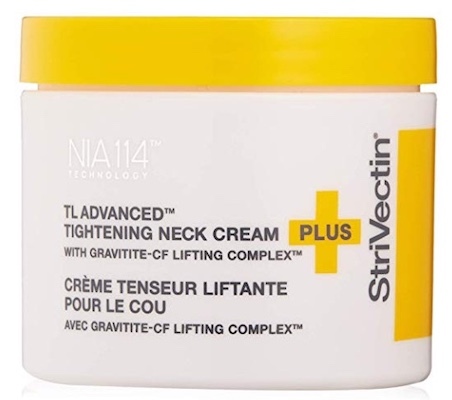 Strivectin’s philosophy is that a neck cream must be uniquely formulated to improve the specific dermatological features of the neck. With this in mind, their clinically tested formulation combines powerhouse compounds such as peptides, hyaluronic acid, and a unique lifting complex to address age spots, fine lines and sagging. After four weeks 92% of users noted more even skin tone, and after 8 weeks 90% of users noted firmer, more lifted neck skin. SPF is incorporated into this multitasking formulation, ensuring that sun protection, hydration and gentle lifting are all achieved simultaneously. Vitamin B3 reduces the appearance of pigmentation spots on the neck, neuropeptides promote collagen production and firm the skin, while vitamin C ester gently smooths out the appearance of fine lines and wrinkles. This emulsion glides onto the skin, specifically targeting crepiness, fine lines and dryness. The formulation contains ferulic acid, an antioxidant that helps to protect the skin against environmental damage, and retinol, which over time reduces the appearance of wrinkles and subtly lifts the skin. At the same time, the sunflower seed oil found in this product is deeply hydrating. 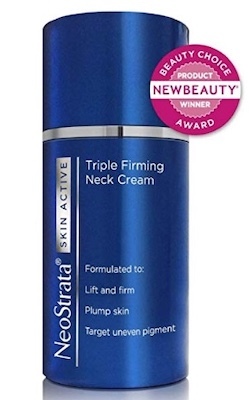 This cream enhances the appearance of neck skin on three fronts: it boosts collagen production with NeoCitriate, gently exfoliates uneven pigment and age spots with NeoGlucosamine, and deeply hydrates with vitamin E and shea butter. Apple Stem Cell Extract fortifies the product by preserving the longevity of the skin’s cells. 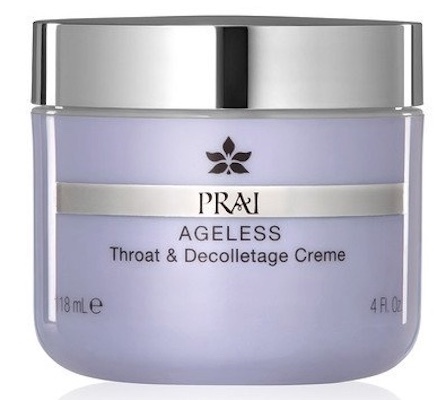 Designed specifically for the neck and decolletage, PRAI’s formulation is another all-round neck enhancing cream. It claims to rejuvenate the skin of the neck by deeply hydrating dry, crepey skin with vitamins A, E, and shea butter. It also brightens discolorations and age spots with grape seed extract while subtly lifting unsightly turkey neck sagging with it’s unique Septilift technology. It’s marketing claims visible results in seven days, and according to its cult following, it achieves its goal. This dense formulation is suitable for all skin types and works to firm saggy skin with its tri-peptide complex. Best applied at night, the profoundly hydrating properties of avocado oil and glycerin combat dryness and minimizes the appearance of fine lines and wrinkles. The cream can also be multi-purposed as a mask. 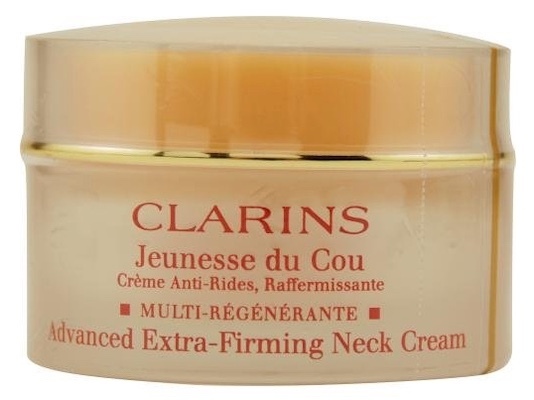 Targeted at women aged 40 and over, Clarins’ celebrated neck cream focuses on restoring lift and firmness to the skin. This cream incorporates oat kernel extract for its potent moisturizing and softening qualities, while sugars from the oat grain serve to firm and smoothen the skin. The green seaweed extract contained in the product further plumps and moisturizes the skin. Fans of this cream tend to note the smooth, velvety texture of their skin after application. 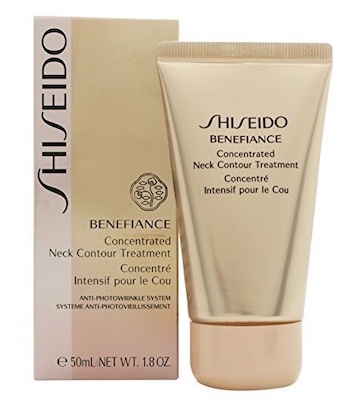 Shiseido’s formulation is specifically aimed at improving the texture and contours of the skin on the neck. One of it’s key active ingredients is hydroxyproline, a high-technology amino acid that mimics the skin’s own natural building blocks and assists with natural collagen production. Shiseido’s Firm Support Formula forms a film over the skin to lock in moisture and offer protection, while Chlorella extract helps prevent the formation of future wrinkles with its antioxidant properties. Award-winning Nectifirm Advanced is ideal for those who already have photodamaged skin or noticeable signs of aging on their neck or decolletage. The formula contains eight different peptides that work collaboratively to reduce the appearance of fine lines and wrinkles. Lingonberry extract boosts the skin’s own antioxidant system. Treatments like Ultherapy deliver ultrasonic waves deep into the skin to stimulate collagen production, firming the neck. On average, Ultherapy costs $2600 per treatment, with prices varying between $1,200 to $4,500. Many patients benefit from two treatments. » Read reviews and patient experiences of Ultherapy. Radiofrequency treatments such as Thermage create a heating effect deep in the skin’s dermis, stimulating collagen production while gently firming the skin. You can expect to pay $2000 on average for one Thermage treatment, although prices can vary between $1000 and $5000. » Find out more about the benefits of Thermage. Certain laser treatments such as fractional CO2 lasers help to subtly firm and resurface the skin of the neck, removing sun and age spots, uneven pigmentation, and fine lines and wrinkles. The average cost of treatment ranges from $1500-$3000. » Consult with an experienced cosmetic doctor to find out if one of the above options is appropriate for your neck skin. The skin of the neck has less sebaceous glands and fat than other parts of the body, and is therefore more prone to dryness and wrinkles. Neck creams help to nourish, moisturize and protect the delicate skin of the neck. Regular use of a cream with SPF can slow or reverse the manifest signs of aging, such as sun spots, uneven skin tone, and sagging skin. Pairing a regular skin care regime with a non-invasive treatment can further enhance results. If you think you might benefit from a non-surgical neck treatment, a consultation with an experienced doctor near you will help you determine which procedure is the most suitable for your specific condition.